Sylvester Deas, a church elder, looks up at the new ceiling in St. Mary AME. St. Mary AME Church recently underwent a $107,000 facelift and a special guest is visiting this weekend to help the parishioners celebrate. Bishop Samuel L. Green Sr., presiding prelate, Seventh Episcopal District AME Church, will be on hand for a dedication of the church’s new roof and a worship service on Sunday at 3 p.m.
Three years ago several church elders noticed that the weight of the flat roof, which was part of the original structure that opened in 1965, was damaging the structure of the church. The walls were buckling, the rafters were failing and there was a crack in the ceiling. The renovations began on May 7, 2018. As part of the project, a new pitched roof was installed, resulting in a higher ceiling in the sanctuary. Workers also opened the space above where the choir sits at the front of the church, creating room for a large wooden cross on the wall. “I have been just 100 percent thrilled and pleased with the work that they have done,” Stokes-Smalls said. 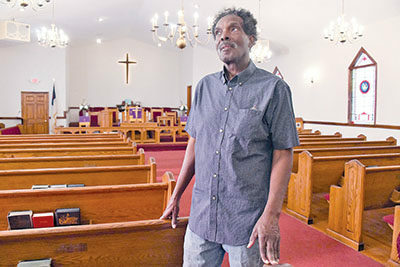 While the roof was being replaced the congregation spent about six weeks worshipping at Pawleys Island Community Church. The last time Green visited was in July 2017 to kickoff the fundraising campaign for the new roof. He brought a check for $10,000, which was added to the $12,000 already raised by the church’s roof committee. The congregation then spent 11 months raising money before securing a bank loan to begin work. Green visited to check in on the progress of the renovations, and suggested a small room between the sanctuary and family life center be remodeled. “It was really old and beat up, top and bottom,” Stokes-Smalls said. New cabinets and shelves are being installed to create a children’s library. The renovations also included a new steeple and a lighted sign on Highway 17.